Extreame Savings Item! Free Shipping Included! 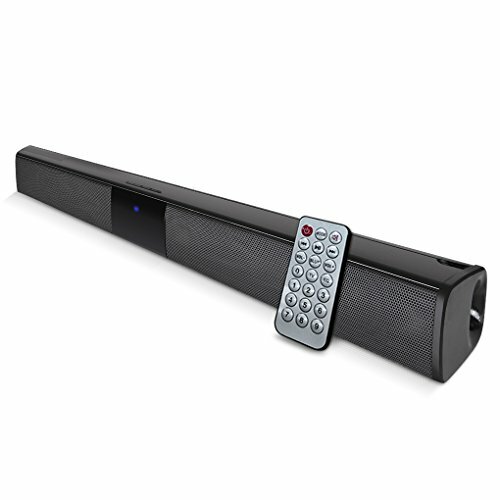 Save 41% on the Sound Bar Bluetooth Speaker Surround bar, 22 inch Wired and Wireless Bluetooth Home Theater TV Speaker Support Bluetooth/AUX/RCA (Black) by Chyu at movies-out.com. MPN: TR524-01. Hurry! Limited time offer. Offer valid only while supplies last. 【ULTIMATE HOME THEATER】- Built-in Four Subwoofer, powered by 4 x 5W drivers, distortion-free at maximum volume. Bigger frequency range with rich sounds. Super bass stereo soundbar, noise reduction effect, perfect for home, dorm room, kitchen, bathroom, car, parties. 【WIRELESS/WIRED CONNECTIONS FOR MULTIPLE DEVICES】- Hassle-free wireless Bluetooth connectivity for smartphones, tablets, computers and smart TVs. Wired connections include optical/RCA/line in input for TVs, DVD players and MP3 players. Also Support TF Cards. 【REMOTE CONTROL】- High-sensitivity IR remote control. Remotely Control All Settings. Adjust volume, select the sound mode, pair with a Bluetooth device and choose the signal source all via the remote control. The function buttons on the bluetooth soundbar itself can also manage all the settings in the event you cannot locate the remote. 【DEEP BASS】- Features 4 full-range high quality drivers and special port tube design deliver strong bass and enhanced volume. 【100% SATISFACTION GUARANTEE】- CHYU Sound Bar has a 100% Satisfaction Guarantee, 30 days no reason refund and 360 days warranty. CHYU is committed to delivering an excellent experience for all buyers. If you have any questions about this product by Chyu, contact us by completing and submitting the form below. If you are looking for a specif part number, please include it with your message.